I went out on our property on April 2nd, 2015, to find some salamanders. 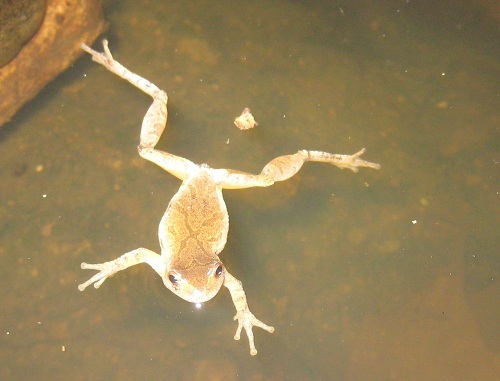 It had been a rainy and warm day, and I figured there would be some amphibians moving around. The pictures and text below tell the story of what I found. I first stopped by our small pond on the edge of the woods, which has salamanders breeding in it every year. 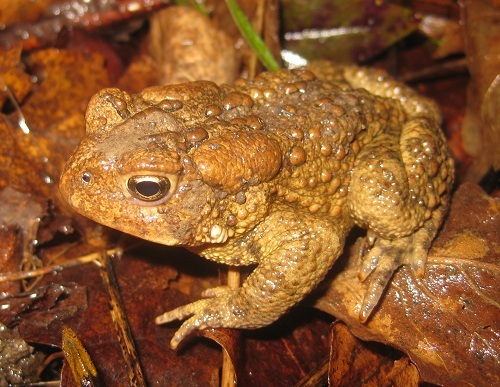 The first thing I found was this American toad (Bufo americanus) close to the water. Looking carefully around the edge of the water, I came across this floating Spring Peeper (Pseudacris crucifer) posing nicely for a picture. The Spring Peeper (Pseudacris crucifer) then decided it was time to leave. 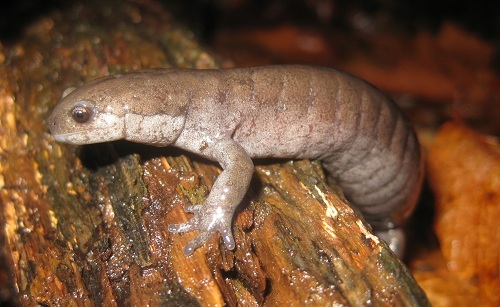 I walked through our woods toward the other breeding pool, but before I got there I found this Smallmouth Salamander (Ambystoma texanum) crossing a stick on the forest floor. I was happy to find it, because this was the first official discovery of this species on our property (our full non-bird species list). I checked the other breeding pool but didn't find much, so I continued farther toward the back of our property. I soon found this salamander, which is probably a hybrid (in this part of the state, most salamanders with blue spotting are some combination of Jefferson and Blue-spotted Salamanders). These hybrid Ambystoma salamanders are the kind that I find most often on our property. I walked by our small pond again and noticed a group of salamanders on the bottom in all the submerged leaf litter; I'm not sure how many there were, but at least 4 and probably more. They were actively moving around and I could see spermatophores on the submerged leaves. I continued on past the small pond and found another hybrid Ambystoma salamander not too far from our larger pond. Continuing to search, I walked around our large pond and up to the driveway and found this small Smallmouth Salamander (Ambystoma texanum) in a puddle near our covered bridge. 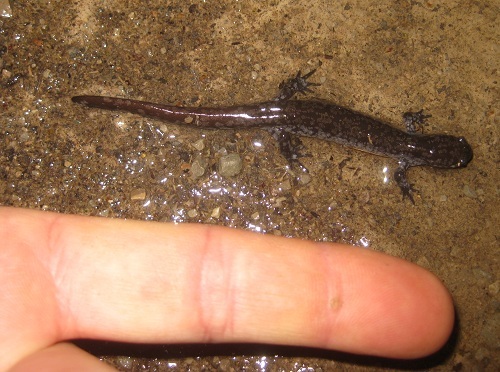 You can see in this picture just how small this Smallmouth Salamander (Ambystoma texanum) really was! 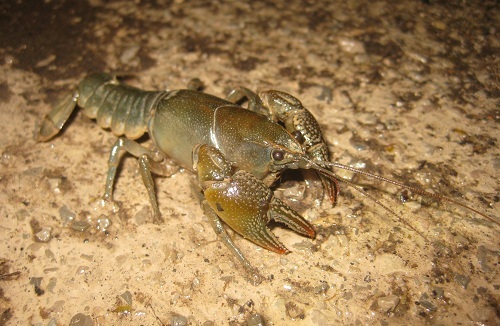 I also saw quite a few crayfish, those in our pond being very large; this medium-sized individual was walking around on our driveway. I'd be interested to know the species identification, if anyone recognizes it. The final location that I checked is behind our barn, which has a lot of wet area that attracts frogs. 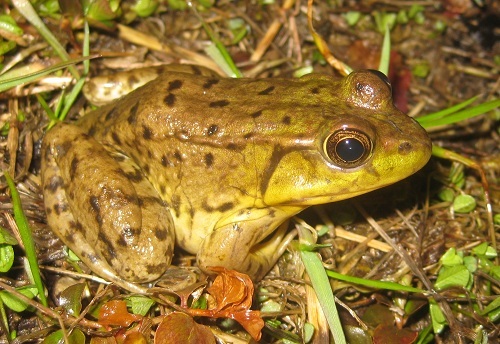 This Green Frog (Lithobates clamitans) posed nicely. In addition to the species in the pictures, I also saw hundreds of tadpoles (mostly from bullfrogs), bluegill, and a few arthropods. Overall, a very successful night and a fun way to spend a couple of hours.